Homeowner Yuval Cohen survived rocket attack by the skin of his teeth; Hamas said to be desperate for truce amid growing casualties. 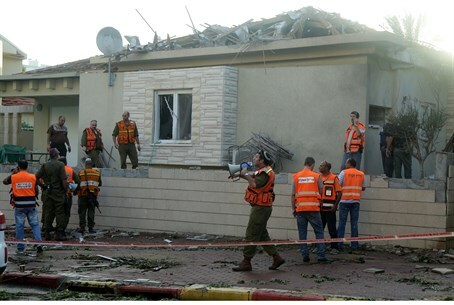 The owner of a house which suffered a direct hit in a rocket attack in Ashkelon this morning, has told of his "miraculous" escape. Yuval Cohen said his family was sleeping when the air raid sirens sounded, and says it was a miracle they had not been killed. "We were in our bedroom when the alarm started. We ran to the children's room to wake them and while we were running with the kids, the rocket exploded in the bedroom," he told AFP. "Luckily, we escaped by a miracle. We didn't even make it to the shelter." 21 people were injured in the attack, however, with dozens more hospitalized for shock. Cohen described the difficulties and trauma faced by civilians in southern Israel, who have been targeted with rockets incessantly by Gazan terrorists. The Israeli government has invested heavily in building bomb shelters and in the Iron Dome missile defense system - although this morning's attack, and a later one on a kindergarten, illustrate those systems are hardly foolproof. And besides for the physical risks, the barrage of indiscriminate shelling is taking a heavy psychological toll. "We don't sleep at nights, we don't sleep during the days, we don't rest at all. Everybody says 'it won't happen to me' but in the end, it did," he said. Since midnight, more than 70 rockets have been fired at Israel, more than 60 of which struck the south while another six were intercepted, the army said. The fighting has continued despite talk yesterday of an imminent ceasefire, with the Israeli Air Force striking several targets in Gaza last night and Tuesday morning, including a Hamas "command and control center". Following the elimination of dozens of "terror tunnels" into Israel, the current objective of Operation Protective Edge is to put an end to the incessant rocket fire targeting Israeli civilians. But that is not a simple matter, considering that most are hidden either underground or in civilian areas. "The goal of the fighting isn't to finish off every last launcher, the goal is to convince the other side to say 'enough'," a senior Israeli military official explained to the Haaretz newspaper, saying Hamas was quite close to that point. Political officials also believe most of the Islamist movement is looking for a quick end to the conflict, particularly after three of its senior military commanders were killed in a targeted assassination last week. "The targeted killings have created a situation in the last week in which Hamas wants a ceasefire," said Science Minister Yaakov Peri, an observer in the eight-member security cabinet. "The man who is digging in his heels... is Khaled Meshaal," he said, referring to the movement's exiled leader who is based in Doha. Islamic Jihad is also said to be keen on a ceasefire, as it has suffered serious damage and casualties during the operation, according to security sources. Meanwhile, Abbas was to convene a meeting of his leadership in Ramallah later Tuesday, officials said. Although Israeli officials have refused to comment on the Egyptian truce proposal, army radio said Prime Minister BinyaminNetanyahu had been locked in discussions late into the night with Defense Minister Moshe Ya'alon and Chief of Staff Benny Gantz. A PA official told AFP on Monday that the proposal would involve the easing of restrictions at border crossings into the battered enclave and allow for the delivery of aid and reconstruction materials. "The disputed points will be discussed in a month," he told AFP, saying they were waiting for Israel's response.